Well, I have very exciting news to share today....we signed a lease on an adorable house in the historic district and we got the keys last night! We dropped by this morning so I could take a ridiculous amount of pictures. 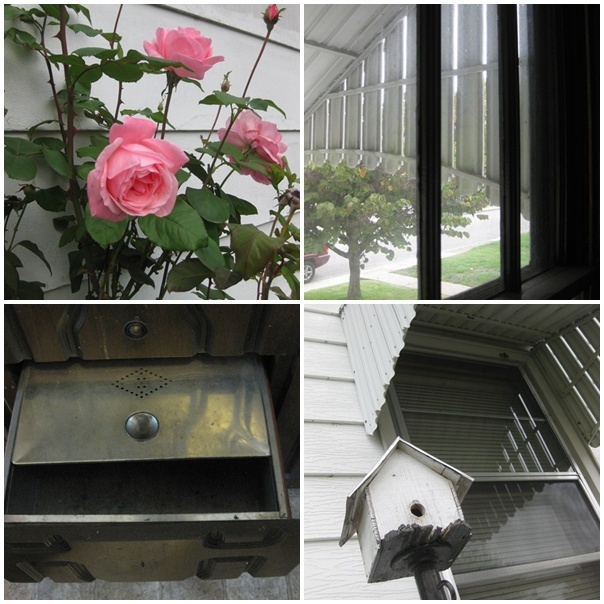 We have a beautiful rose bush, a cute little bird house, metal awnings on all of the windows and a funny little bread/root vegetable box in the kitchen drawer. Our little house is quite small and cozy. It only has two bedrooms but there's a huge basement, dining room, vintage kitchen, small fenced in yard and all sorts of beautiful vintage details. I cannot wait to get it all decorated with my retro furniture and decor but I'm too excited to wait to show it off. old, pink tiles in the bathroom...and it has a pink and white swirled sink! Another room? No- this is my second wardrobe! It's a closet off the dining room with three sturdy metal bars for hanging my clothes plus shelving up top for shoes and other fashion shenanigans. the dining room, which will be super cute one I make some vintage kitchen curtains and get my retro dinette set in here. The wooden panels are hideous but hey, it's vintage! haha! What's this? Well, I needed some new living room furniture and today was a gorgeous day for a garage sale. Right up the street, I found this vintage vinyl rocker for $25- the exact amount that I had in cash in my purse. Meant to be? I think so! It's the same shade of green that's in my cushions from my retro sofa. It's so cute!Excited for you,congrats! Adorable! Congratulations! (Hubby and I are going to be in St. Charles today!) Enjoy your new home. Looks like you already are! Very cute place! I love the new push to rejuvenate neighbourhoods like yours. I wish a few more people would get on board with that here. Congrats! Ok, how awesome is this Brittany, what a super adorable house!!!! I'm so excited for you and by the way you have lost some weight girl, you look amazing! the house is adorable.. Congradulations..KNow you are so excited. I can't wait to see your retro furnishings in here and your special touch..It will be , oh so cute!! You are looking fantastic. I can tell you have lost alot of weight..SO proud for you..
it is so cute! i love the kitchen especially! i can't wait to see how you decorate it! House is so adorable and you are looking amazing! Yay!!! So very very excited for you!! There is nothing more satisfying than putzing around, with some music playing, and artfully placing all of your treasures on shelves and such until it all feels just perfect! You are going to have so much fun decorating!! seriously happy for you! Congratulations its beautiful, I love that wardrobe- I want one so much you are so lucky! Congrats on your new lovely home! It looks amazing, the kind of place I hope my hubby and I will have one day. I can't wait to see all the lovely ways you decorate it. Love it! Congrats on finding such a darling house. Can't wait to see how you decorate it. Whoot! This is so exciting!!! Rip open all those boxes now!!!! This is like perfect timing and an amazing blessing!!! Muah! I love this house soo much. Congrats! The house is adorable! And you look fabulous- so happy! 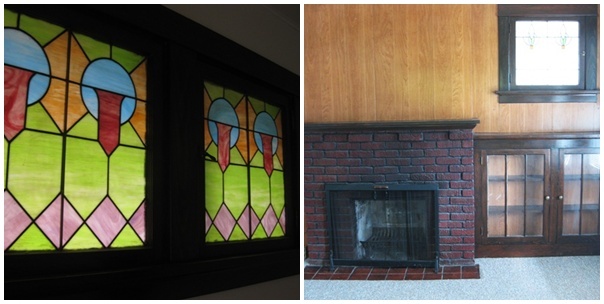 Maybe you can cover that dark wood paneling with fabric? Beautiful, I think I just fell in love with your new home ;). Your new home is adorable! I love the bathroom tiles! Good luck in your new home, it looks just perfect. Congratulations Brittany! I love your new house and think it will be wonderful for your family. (Hubby and I just moved this weekend and I'm hoping to get a post up soon as well). We (I mean me) really wanted to find a 1930's home, but nothing seemed to work out, so I am a but jealous of your home with all of its character. Don't you worry for a minute about that wood paneling. It would look so beautiful if you painted it and used a coordinating color on the top half. I can't wait to see all of the changes you make to make the home yours! Wow, hun....you are looking FAB! Woohoo! I adore your house, it's deliciously gorgeous. Can't wait to see it decorated. I can't wait to see what you do with your new / vintage house!! and you are looking great-- I absolutely love the gray and red outfit!! Happiest congrats, dear gal! I'm thoroughly thrilled for you and your family, and am so excited to see the (flat out amazing!) way you're going to kit out your new abode. Congratulations! It looks like a fairytale - and you look like a dream! :) I cannot wait to see how you decorate it. I love all the beautiful details. I would like a 30s styled home someday. You should ask your landlord if you could paint the wood paneling...we've had several let us do things like that. I wish we had housing options like that here. We have a few historic neighborhoods here but they are not in "good" areas. The houses that are in "good" areas are out of our price range. I can not wait to see how you put your touch into this house. Congrats. Happy to see you're doing better than you were a few months ago!